Document of the Dead is a 1979 documentary film by American filmmaker Roy Frumkes that was largely shot during the production of the 1978 film Dawn of the Dead. Originally a 66 minute feature, it has since been expanded two times. First, in 1989, when an 85 minute version was released, featuring new interviews from the set of Two Evil Eyes. 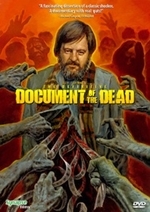 Then, in 2012, it was released as The Definitive Document of the Dead, with a 102 minute runtime, featuring new footage filmed through 2006.